Here’s another batch of tools to checkout. Hope something catches your eye! Highland Woodworking is carrying The Rikon Mini Lathe. This package was featured in our “Father’s Day Gift Guide”, but well worth mentioning again. * Rikon has created a lathe with an impressive 12″ swing and 16″ between centers. * Increase the bed length in 24″ multiples with optional bed extensions. of the headstock allowing quick belt replacement without removing the spindle assembly. * A convenient handle is helpful for moving the 89lb. mini-lathe. 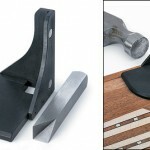 Lee Valley & Veritas recently introduced their new Precision Inlay Corner Jig. registration in a pair of perpendicular grooves as small as 1/16″ wide and 1/64″ deep. * Four embedded 1/4″ rare-earth magnets ensure the included corner chisel travels true in the jig. with a 35° bevel on each face. * Also useful for tidying corners of recesses in inlay panels, stringing, or any 90° corner. Eagle America introduces their new Filter-A-Fan. Quick and easy to use jig that turns a simple box fan into an air cleaner. 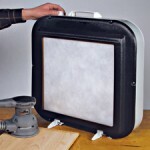 An affordable way to breathe clean air while doing common shop tasks such as sanding. * Filter-A-Fan is a frame that attaches to a box fan. mold spores, pollen or anything else in the air. put the Filter-A-Fan frame over the grill and reattach the screws. Then just slide a filter in. Thanks for the links, I may look into the box fan filter. Just a heads up, the inlay corner jig link goes to the wheel marking gauge. I really like that Marking gauge apparently CHORTLE! I’ve always been impressed with Rikon’s products. They hit the scene with their band saws, and instead of just copying what everyone else was producing built a better saw at a competitive price. I have met several folks from the organization from service to engineering, and have always been impressed with the people as well. They are local to my area, so I am thrilled to see them continuing to grow their product line. I’m not yet a turner, but you can be sure when I finally make the leap I’ll be looking at Rikon’s lathe very closely. I like the box fan filter idea. I have no desire to shell out hundreds for one of the air filtration systems, although I’m sure they work well. I have a 20″ box fan that I tape a 20″ x 20″ furnace filter to. I can move it around close to tools that don’t work well with a dust collector, such as my band saw and miter saw. I also use it next to where I’m sanding. But it’s crude; I tape the filter to the fan and if I’m not careful and don’t clean the fan off first, the sawdust gets on the tape and soon my filter is falling off — just when I want to use it. Eagle has a handy idea. Now, the wheel gauge I have bought. I happen to have the old Norm corner chisel. Never used it. LOL. Luckily, I’ve gotten less inclined to buy gimmicky stuff over the years. BUT, I still LOVE gimmicky stuff!